For too long now have I neglected this awesome technique! I have, over the last few weeks, been working on my economy picking. It is a technique that I have dabbled in but never fully embraced or brought into my soloing/playing with any conviction. Well, that stops now! There currently exists only one post on getting started with this technique on my site – this one. I enjoyed the process of putting that site lesson together and it encouraged me to get better at economy picking. Over the last few months, whilst waiting for the bulk of my equipment to join me on the other side of the planet (my guitar arrived a couple of days after me), I have gotten a fair bit of unamplified practice in including some really cool economy picking licks, runs & drills. 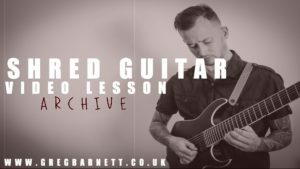 Not only do I intend to make these ideas a core part of my playing but I will also build towards making a full video lesson download pack on the technique and how it can be incorporated into ones playing. This won’t just be licks to learn and absorb but a thorough breakdown of the pros & cons and in depth analysis on situations where one would choose this technique and how it compliments other techniques. I once had a limiting belief about economy picking – that it was all or nothing, switch to economy picking and never alternate pick again. What nonsense! Economy picking has a completely different sound to alternate picking by its very nature – the pick drops to a new string when changing strings so will, obviously, not hit that string with as much velocity. My attitude is now to use alternate picking for a more aggressive sound and economy picking for a smoother sound. That is a better reason for choosing one technique over another in a particular situation – TONE!